Don’t look now but someone stole Christmas! This thief is sly, too: he carefully replaces everything he takes with some other distraction. I first recognized the evidence of his felony while at the mall. Christmas kindness had disappeared, hijacked from the hearts of shoppers and replaced with pushing, shoving, and darting in front of others. Christmas joy has also come up missing, stolen and replaced with profane grumbling over slow cashiers and impatient demands for immediate service. That got me thinking. This thief has ripped off our sense of community and replaced it with a focus on individual rights and privileges as well. He has even snuck into our homes, taken our casual, intimate family time, and shoved frenetic schedules filled with crowd fighting and shopping sprees in its place. I think he even threatens to rob us of our very family, carefully replacing it with toys and gadgets that allow us to be alone, engaged in our own world while we sit in the same room! Someone needs to stop this little thief, catch him and teach him a thing or two. But, he is a shadowy figure, slipping through our hands and minds with no substance to grasp. He is elusive. We have to use a different tactic to end his reign. So, I’ve devised a plan. I hope you will join me in implementing this six-part plan to stop the thief of Christmas. The first step in stopping the thief of Christmas is keeping him from stealing the Christmas spirit from your own life. Model the Christmas spirit in your home and community. Practice kindness. Be polite. Look for opportunities to give generously of your time and money to others. Celebrate Christmas. Spend time with your family. Make time with your family a priority in your life. put down the video game, turn off the phone, and spend time in conversation with your family. Play a game like “Apples to Apples” or “The Game of Things.” Laugh. Talk. Enjoy time together. Invite another family over for Christmas games or snacks. Share some Christmas cookies. Practice sharing friendship, fun, and togetherness with others. Watch some Christmas specials. Talk about the message each one communicates. While you’re at it, watch the commercials and talk about the messages they communicate as well. It will likely provide an interesting contrast to discuss, the contrast of between the thief of Christmas displayed in the commercials and the true Christmas spirit communicated in the Christmas special. Just for fun, check out Jerry Seinfeld’s acceptance speech for the Clio–very insightful…and humorous. Remember what Christmas is all about…a gracious, generous, and holy God who gave a Child, His Son to ransom our freedom and adopt us into His family. The foundation of this six-part plan rests on relationships. Intimate relationships with our family and community will protect us from the Christmas thief and guard us from his evil scheme to replace our heart’s true desire with counterfeit decoys. By the say, did I start this blog by saying “Don’t look now but someone stole Christmas”? Let me take that back. Open your eyes. Look now. 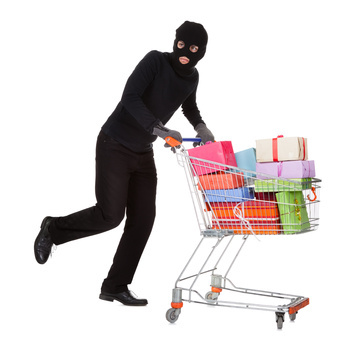 Keep your eyes open to catch the Christmas thief and end his tyranny of robbery. Join me in practicing the six-part plan above to stop the thief of Christmas and find the true joy of Christmas.